My 8-month old has never eaten well so I give her milk in the night - is that ok? Once weaning gets underway, continued night feeding can have an impact on your baby's appetite during the day so that she isn't hungry enough to enjoy solids. So she may continue to be disinterested in food, and instead fulfil her energy needs from milk during the night. And so the viscous cycle continues. To break the habit, you can either go cold turkey - prepare for a few difficult nights and find other ways to comfort her if she wakes up - or instead you could gradually reduce the amount of milk. To encourage eating well, try to always sit and eat something with your baby at mealtimes - let her copy you opening your mouth to take food. As she is now 8 months, you can try a combination of mashed foods from a spoon, along with pieces of finger foods. Encourage her to experiment. As her night-time milk reduces, and her confidence with solids increases, you should hopefully see an improvement in her eating soon enough. I get asked this A LOT! If only there was a simple answer. But there isn't I'm afraid because babies are all so different. Some are fantastic eaters from the word go, others take a few months to get the hang of it. Comparing your baby to others, or to the quantities laid out in weaning books or online plans, can often end up causing more worry. So follow your baby's lead. Start with small amounts, you can always offer more. Look for signs that she has had enough to eat, for example, turning her head away, clamping her mouth shut, getting fidgety or pushing the food away. You'll be an expert at figuring out how much food your baby needs in no time! Eventually, yes. For babies, once they are eating reasonably well three times a day, you can start to bring in a dessert. A good rule of thumb is to offer one fruit-based and one dairy-based dessert (for example, yogurt or rice pudding) each day. So if the main course is something like macaronic cheese or fish pie which contains dairy, balance it out with a fruit dessert. And vice versa, if the main course is let's say spaghetti bolognaise or tuna jacket potato, then you could give a dairy dessert. A second course (assuming its not always cake or ice-cream) is a great opportunity for your child to take in extra energy and nutrients. But it should never be offered as a bribe for eating the mains - instead it should always be offered on a level playing field to prevent the 'reward' food (dessert) seeming more tasty or 'valuable' in the eyes of the child. What types of foods are most important for my 2-year old? 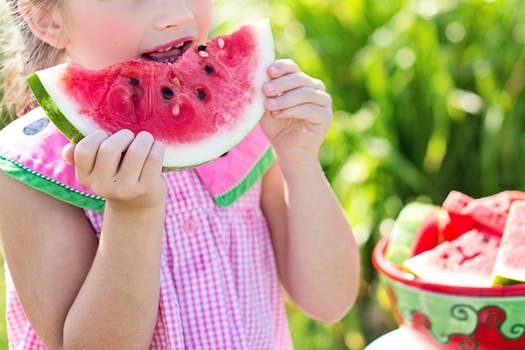 Toddlers should eat a range of foods from each of the four main food groups: starchy foods (potatoes, bread, rice and pasta), fruit and vegetables, dairy foods (milk, cheese and yogurt) and protein foods (meat, fish, eggs, beans and nuts). Each food group provides different nutrients so they are all equally important. The British Nutrition Foundation has produced a handy guide for toddler portions from each of the food groups, called '5532-a-day'. This may be useful for planning daily menus for your toddler and help make sure that you've got all food groups covered. I heard babies shouldn't have a bottle after 12 months - is this true? After a year, large milk feeds are no longer nutritionally necessary. And because it's easy to drink large quantities of milk from a bottle (no chewing required!) it makes sense to think about binning the bottle from this time. This doesn't mean it has to happen the day after your baby's first birthday. As a general guide, anytime from around 12 months is good but, like all child behaviours, the earlier you can break a habit, the easier it is later on. Too much milk can fill up small stomachs and have an impact on appetite - before you know it you've got a fussy eater on your hands. Milk is a poor source of nutrients such as iron, so too much of it could contribute to iron deficiency which, at the extreme, could lead to anaemia. Bottle-drinking doesn't require much effort from the tongue, mouth or jaw muscles which, in time could become a bit lazy, possibly affecting speech development. As milk contains natural sugars (lactose), sucking on a bottle for prolonged periods where milk is in constant contact with new baby teeth, could lead to tooth decay. This is often referred to as 'bottle caries' and toddlers who are left to fall asleep with a bottle of milk in their mouths may be particularly prone to this. Why does my child eat well at nursery but not at home? This is such a common scenario, and so frustrating for parents. At nursery, children are often influenced by peer behaviour, so they will want to eat like the other children. They've also most likely clocked onto the fact that if they don't eat what they're given, they won't be getting anything else. Number one lesson: don't offer alternatives! Or else you'll be feeling like a short-order chef before too long. Also think about the attention children get, or don't get, if they refuse a meal at nursery. Probably a lot less than at home! Yes, if they are under five. The UK Department of Health recommends that all children from 6 months to 5 years have a daily supplement containing vitamins A, C and D.
The exception is babies who are drinking 500ml or more of infant formula per day - they don't need supplements as the formula is fortified. It is also important that babies who are breastfed from birth receive a supplement of vitamin D every day. You can read more about vitamins for children here. I'm always happy to answer parent's questions. If you run or attend a group and would like me to come and do a 'Let's Talk About Food' Q&A session please get in touch.